Join Us at the 2015 ASLA Expo! This year’s event is 11/7-11/8 at Chicago’s McCormick Place. Join us in our booth (#916) – we’d love to show you our newest products, introduce you to our design team, and raise a glass with you at happy hour! 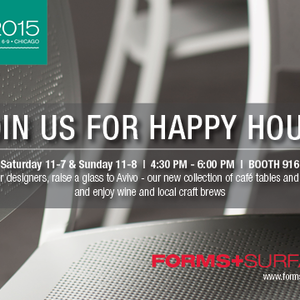 Front and center you’ll find Avivo Tables and Chairs, our brand new line of café seating. Also on display will be our Rincon and Light Column LED Pathway Bollards, along with their taller bollard and pedestrian counterparts. Avivo Tables and Chairs bring a distinctly F+S point of view to café seating. A fitting choice for hospitality, healthcare, and other gathering spaces, the line blends a modern aesthetic with versatile design options and is at home indoors or out. Both tables and chairs feature beautifully detailed aluminum frames with a durable powdercoat finish in standard or custom colors. Avivo Chairs are stackable and available with or without armrests. Seats and backs are powdercoated aluminum with or without three different perforation patterns. Avivo Tables come in three standard sizes for maximum versatility: 40"x40", 40"x90" and 40"x180". There’s also a bar-height table configuration. Table top options include powdercoated aluminum with perforation patterns to match the chairs, VividGlass, and the newest addition to our collection of responsibly sourced hardwoods: FSC® Recycled reclaimed Ironwood slats repurposed from New York’s South Street Seaport. Pathway Bollards are the newest branch of our Outdoor Lighting program. Two new fixtures comprise the line and add breadth to our existing Rincon and Light Column families. Both pathway bollards are simple geometric forms shaped by clean lines, stainless steel construction, and high-performance Cree® LEDs in 3000K warm white and 4000K neutral white. The Rincon Pathway Bollard is 4.5" square and 9.5" tall. The Light Column Pathway Bollard is available in 5" and 6" diameters to match our other Light Column designs; it is 9.75" tall. Both pathway bollards can be used on their own or as a complement to each family’s standard-height bollards and pedestrian lighting fixtures. And both give designers one more way to carry a look across a property while meeting diverse outdoor lighting requirements.